This could be a number of things, depending on how black it is. 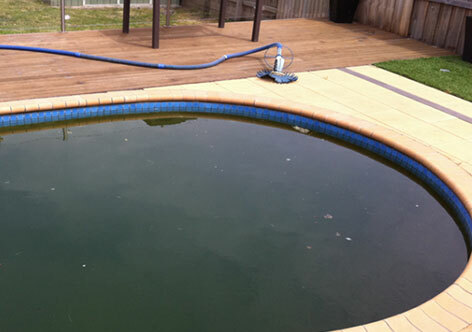 There could be a lot of dirt and grime being blown into your pool, from building work going on around you. If the heating system has not been on for a long period of time, chlorinated water stays in the tubes and attacks the rubber, eating the surface of the tube. if there has been very high chlorine levels in the pool for a length of time, it will attack the tubing. The pool is an undercover or indoor pool you tend to get more of a chloramine build up which also attacks the tubing. Tea leaving only occurs in about 1% of rubber solar pool heating systems and can be avoided with proper chemistry. Being a problem with pool chemistry or an end-user issue, (not a fault with the actual material), the manufacturer doesn’t cover this under warranty. The rubber solar systems, EPDM, are still a good system as long as the owner is aware of these issues. We use a PVC Nitrile collector system which is not prone to these problems. If you have this problem and it is the only time it has happened, you may be able to clean the tubing out ,if you keep your chlorine at 1.5-3 ppm and use the Winter mode on the controller, you could be fine. Let your chlorine drop down to about 1 part per million- then run your solar pool heating for 24 hours straight by plugging the solar pump into the mains so it’s not controlled by the controller.If you have a boosted system make sure you turn your chlorinator down so it don’t keep making chlorine, this should fix the problem if not too much damage has been done. If this is an ongoing problem, you will need a new collector system.